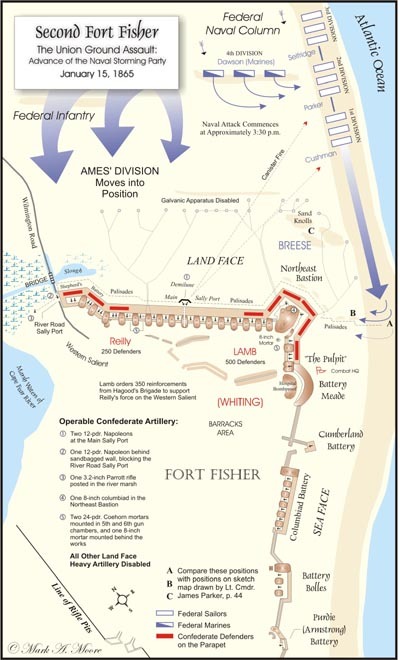 With the fall of Fort Fisher on January 15, 1865, the last major port of the Confederacy was sealed. After Butler’s blundering attempt to take the Fort ended in a disgraceful retreat, the Union wasted no time in outfitting a second expedition. 60 ships under Admiral David Porter made up the naval component while Major General Alfred Terry led a force of 9000 troops from the Army of the James. Colonel William Lamb commanded the 1900 man garrison of Fort Fisher, while Major General Hoke commanded a division of 6400 men a few miles north of the fort. FORTRESS MONROE, Tuesday, Jan. 17 — 10 P.M. The rebel flag of Fort Fisher was delivered to me on board the steamer Spalding, off that place, yesterday morning, Jan. 16, by Major-Gen. TERRY.